If lobster instead of Canadian bacon is used to make Lobster Benedict, we figured we could add steamed Asparagus to make Asparagus Benedict. But we weren’t totally satisfied until we switched out the English muffin in favor of a Celeriac Cutlet. It’s an amazing combination of complementary tastes, and if vegetables are involved, it’s healthy, right? Make the Celeriac Cutlets first and set them aside. Lightly steam the Asparagus spears and cut them in half lengthwise to fit on the Celeriac Cutlet. Bring the Black Forest ham to room temperature (or gently warm the Canadian bacon in a skillet over low heat). Poach the eggs. 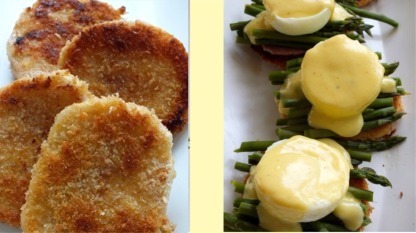 To build the Benedict, place two Celeriac Cutlets on each plate. Spoon a small dollop of Hollandaise sauce on it. Top with two draped pieces of ham (or the Canadian bacon), then the Asparagus spears, and then the poached egg. Smother it all with the lemony Hollandaise sauce and sprinkle with freshly chopped Chives. Serves 2. For the Hollandaise, whisk together the egg yolks and lemon juice in the top of a Bain Marie over hot water (don’t let the water touch the bottom of the pot). Over medium heat, whisk constantly. Cut the stick of butter into eight tablespoons. Add four tablespoons of the cold butter to the egg yolks and lemon juice. Stir with a wooden spoon constantly until the butter has melted. Add the four remaining tablespoons of cold butter, stirring constantly to combine and emulsify. Make sure that the butter melts slowly so that the yolks have time to cook and thicken. Once thick, remove the insert from over the hot water. Do not overcook because it could separate. Season to taste with salt and pepper (and finely grated lemon zest for a bigger lemon flavor). Serve warm or at room temperature.